Lemonilo is on a mission to build a healthier, happier society. With this in mind, we curate and also create various healthy products that would delight you. Discovering your favorite healthy products is now easier: you can choose products by what you value the most, such as: halal products, low calories products, or gluten free products. Simplified checkout process: we simplified the checkout process and now shopping at Lemonilo can be done with just 3 steps. 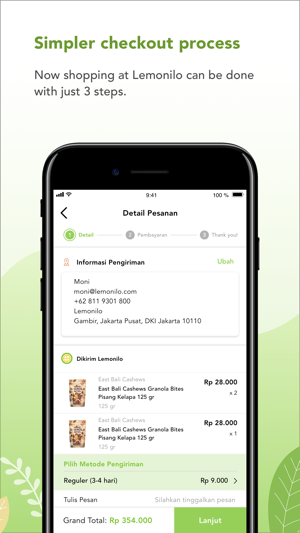 A fresh new look of order tracking: no more hassle to track your order, we keep you updated and give you a brand new look to help you track your order. 100% HEALTHIER: All products listed in Lemonilo have passed our strict curation process and are free from 100+ hazardous ingredients. AFFORDABLE & PRACTICAL: Lemonilo presents healthy & practical products at affordable prices for all needs. 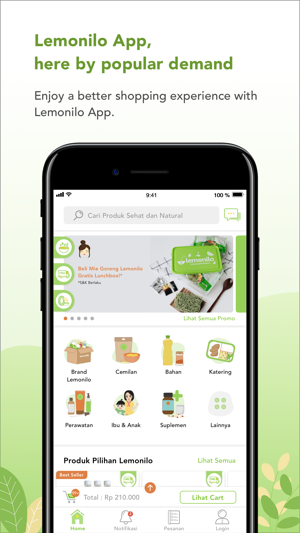 SUPPORTING SMALL & MEDIUM ENTERPRISES (SMEs): Lemonilo partners with and empowers SMEs from all over Indonesia to build a healthier Indonesia. 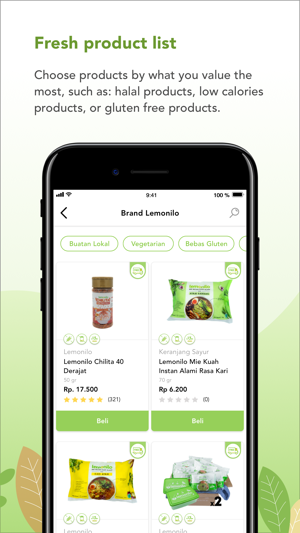 APP-ONLY DEALS: Lemonilo offers various promos that are available only in our app. Be the first to know our app-only promos! CUSTOMER SERVICE: Have problems ordering? Or have questions on a specific product? You can chat with us from Monday to Friday, 09.00-17.00 Jakarta Time, or Saturday, 09.00-15.00 Jakarta Time. Finally App nya jadi! Now belanja jadi lebih mudah!